Welcome to the Tablet Time Nexus 10 edition Giveaway! This event is made possible by Making Sense of Cents and FITnantials, and is hosted by Measuring Flower, Grandma’s Secrets to Savings, and Life With 2 Boys! 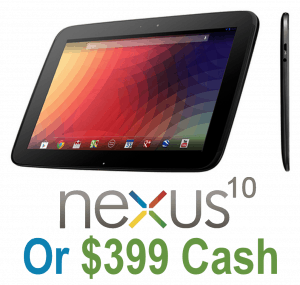 I’ve joined them and a bunch of other bloggers to offer our readers a fabulous prize: Nexus10 OR $399 cash (winner’s choice)! The giveaway is open to USA & Canada and ends 1/28. If you choose the money you must have a Paypal account. Good luck everyone! Thank you for this contest- I’d love to win! FYI–the link for the RSS feed for my creative way is missing. Would love to win!! Thank-you!! This would bring me a bit closer to the 21st century 🙂 Thanks! I would love to win this 🙂 Fantastic giveaway ! couldn’t find the bonus code but love giveaways! I would love to win this! Thanks! Liked on Facebook! Shared! I love this giveaway and think it’s the most awesome Prize ever.Thanks. There is no link to click for the “My Creative Way RSS”. There is also no RSS link anywhere that I can see on the page for the “Mama Zen Blog RSS”. im from Philippines but I do following you Stacie!God Bless. Great prize; thanks for bringing us this chance. All RSS feeds are set up to MyYahoo cdlk1 (at yahoo) account. There was no space to put it, and it’s a different email than the one I entered with, so I just wanted to let you know! Thanks so much for the great giveaway!